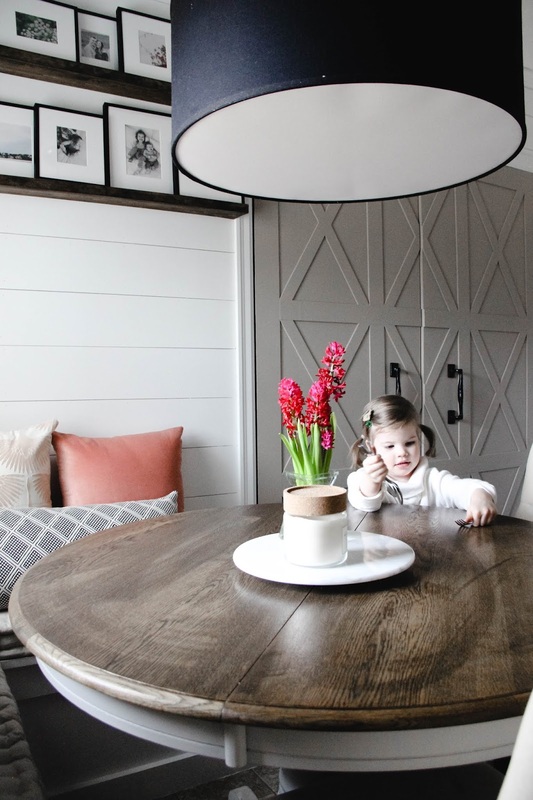 My latest design project is one of my favorites to date, and I'm over the moon to share it with you today! 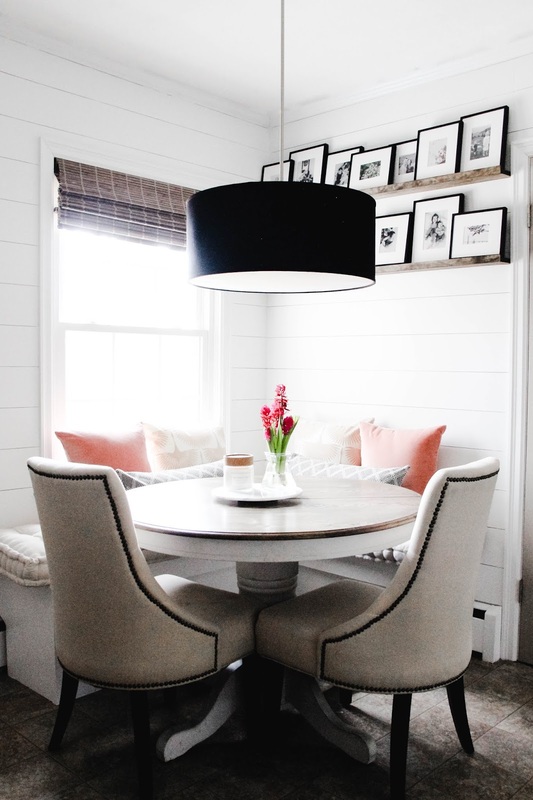 What started out as a simple kitchen nook, is now a quaint space full of charm and personal touches, highlighting family life in the place we gather toward the end of every day. Not only that, it's a great representation of my evolving style and the direction I'm striving to take the rest of our home. When imagining how I could transform the nook, I knew I wanted to bring in personal elements, but wasn't sure how to do that in a new and unique way. I craved a statement piece that told a story and made the nook feel like its own space, not just an add-on to the kitchen. I kept coming to the back wall. 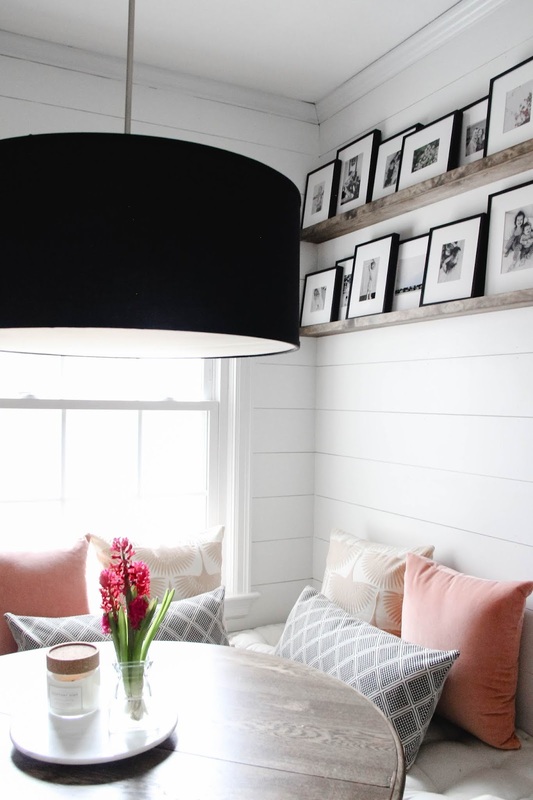 It needed something bold, without overpowering the brightness and airiness of the shiplap. It needed a piece that stood alone, but complemented what was already going on. And that's when it hit me. I wanted to showcase personal photos that I have taken over the course of the last two years. 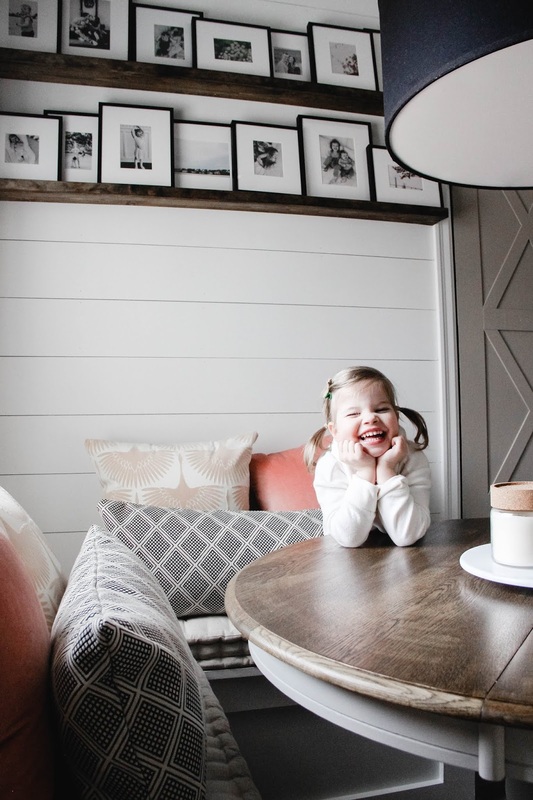 I wanted to share the snapshots of us doing life, just like we do life around our nook table. Once I got the design ball rolling, I envisioned floating shelves just high enough to be different, but low enough to create balance and easily frame the collage of photos I wanted to share. Instead of my typical symmetrical gallery wall, I wanted assorted and varied. 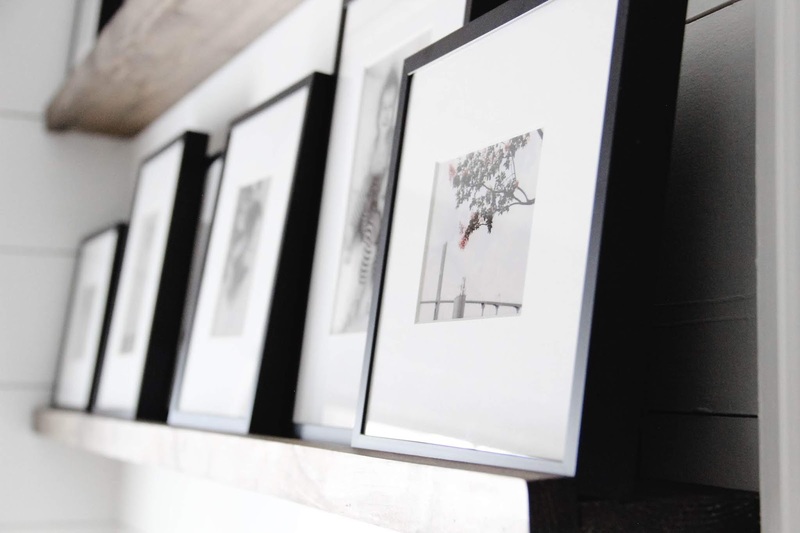 I loved the idea of overlapping frames in various sizes. And I really loved the thought of using photos of our family, while also using photos of the places we've visited together. There was no one better to partner with on this design project than Mpix. They are my go-to for framed prints and stand-alone photos. Their quality is none other, and the customer service is exceptional each and every time. I love the options I have when creating the look I desire; I can tailor every little detail from start to finish. Since I was going with an asymmetrical design, I wanted to keep the type of frame the same, to offer cohesiveness. Black metal is timeless, as are black and white photos. So I opted for those two elements and also incorporated a hint of color through the photos of the places we had been. 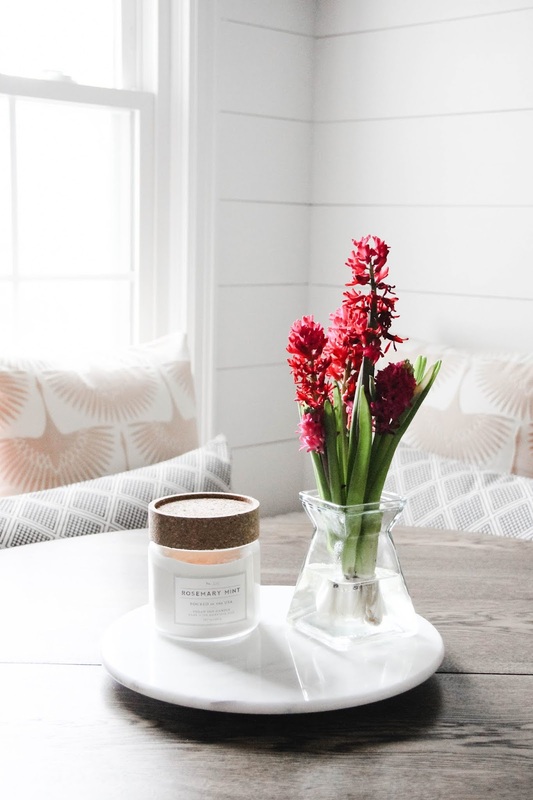 If you mix and match photos this way, I recommend selecting photos that offer a pop of one bold color, while the majority of the picture remains neutral (ie: a muted sky as the background). To add even more congruity, I used white mattes in each frame to really make the photos stand out. Another reason I love to use mattes is to create visual spacing within the staggered frames. It keeps the gallery from looking cluttered, and gives each frame/photo its own identity. Cut the base boards and the ledge boards to fit the length of the space. 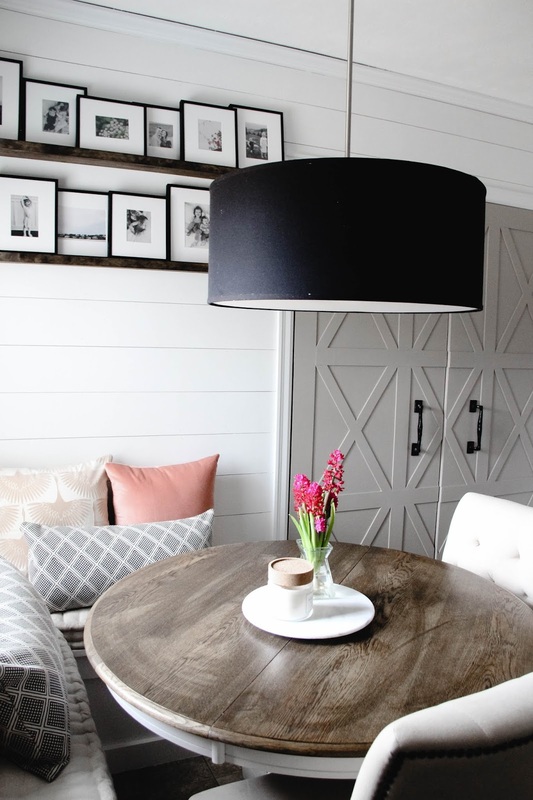 Stain all boards, and let dry for about two days (to help eliminate a strong odor). Locate the studs in the wall, then measure out accordingly and mark on the base boards. In the marked spots, drill the holes through the front of the base boards, exiting the back. You will drill two different hole sizes into the same place. Start by drilling a hole the size of the screw all the way through the board. The second hole is to sink the head of the screw into the board so that it does not lay flush to the board, but rather inside the board. Make sure the screw will stick far enough out of board so that it will go into the stud of the wall, anchoring the shelf. Using the screws, attach the base boards to the wall. Now level the ledge board to the front of the base board and use a nail gun to attach. Our shelves are 12.5" apart. The base of the bottom shelf is 64" from the floor. Place the thin wood at the very front of the base board, where it meets the ledge board. This will give the frame the needed angle to hold up without falling over. **You may not need this for a wider base board, but I wanted thinner base boards for this space, and this is how I compensated for it. Make sure you select an assortment of landscape and portrait photos for print. 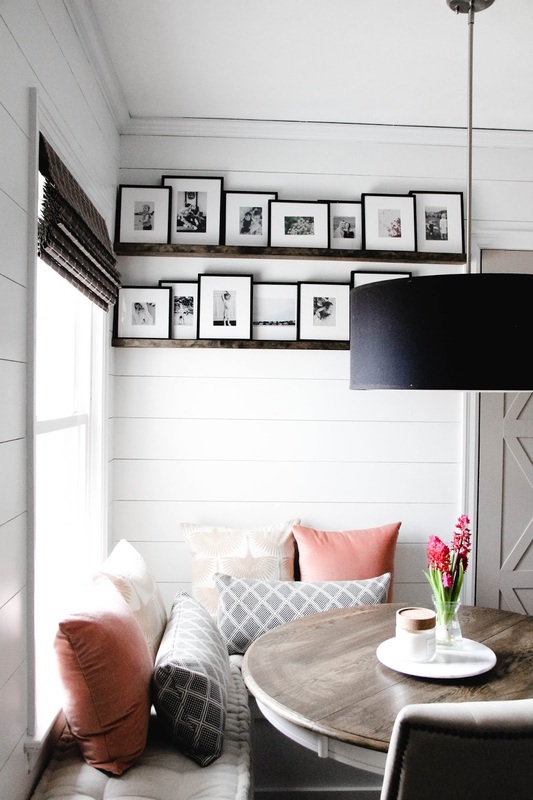 Layer the frames across the boards, separating heights and staggering some photos on top of each other to give an eclectic gallery feel. Intersperse the colored photos within the black & white photos. 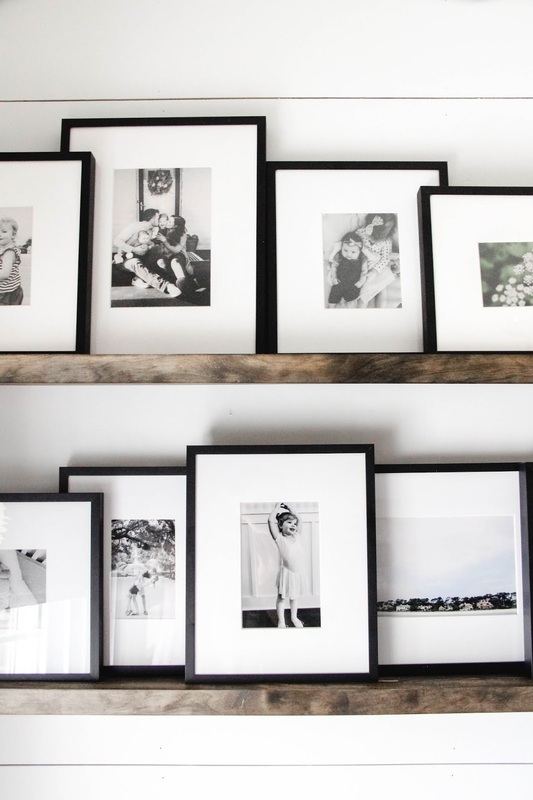 There are so many different ways to arrange framed photos. Whether you change the frame itself, from the material to the size, or opt to use a matte or not, the options are limitless with Mpix. Give it a try yourself, and customize the right frame(s) for your next project! A huge thank you to Mpix, who sponsored this post. All opinions, content, and photos are mine alone.